Click here to listen to yesterday's Pearlsong Conversation with Tracey L. Thompson, author of the new novel Fatropolis. Fatropolis is the alternative history, paranormal romantic adventure of a young fat woman with low self esteem who falls into another world where fat people lead happy, normal, guilt-free lives. Most of her life Jenny has felt she's not good enough, not attractive enough, because she's fat. Then one day she stumbles through a portal between a world that values thinness and one that values roundness. Sometimes falling can wake you up. Fatropolis is available in original trade paperback and ebook from Pearlsong Press and your favorite booksellers. Read and share an excerpt below. Tracey L. Thompson was born and raised in southern California and now resides in northern Virginia. She is a wife and the mother of five children. After overcoming domestic violence, divorce, single motherhood and low self-esteem, she went on to earn a master’s degree in psychology with a specialization in marriage & family therapy from Chapman University, and now has written a novel that sheds light on the issue of weight discrimination in a fun and fanciful way. 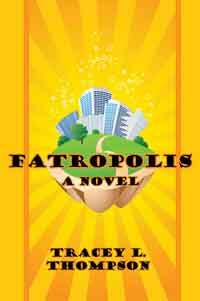 Read and share an excerpt from Fatropolis by clicking on the Bookbuzzr widget below. Click here to listen to and/or download the hour-long mp3 recording. Update 11/11/12: Click here to listen to and/or download the recording of this Conversation with Tracey L. Thompson, author of Fatropolis. Join us Sunday, November 11, 2012 at 5 p.m. Eastern/ 4 p.m. Central for a Pearlsong Conversation with Tracey L. Thompson, author of the new novel Fatropolis. To receive the teleconference call details (phone number & access code), send an email to pearlsongconversations@pearlsong.com. The call details will be automatically emailed to you. There is no cost for participating in the Conversation, other than any long distance toll charges that might apply. Click here to listen to or download the 54-min mp3 recording of today's Conversation with Louise Mathewson, author of A Life Interrupted: Living with Brain Injury. A Life Interrupted is a collection of poems chronicling Louise's recovery from a brain-damaging car accident. The book also contains a list of journaling therapy writing prompts and other resources she found helpful in transcending trauma. Louise Mathewson holds a master’s degree in pastoral studies from Loyola University in Chicago. Her work has appeared in numerous publications, including Wordgathering: Journal of Disability Poetry, Mochila Review, Boulder County Kid and Sasee magazines, and the anthologies Cup of Comfort—Vol. I (Adams Media) and Borderlines ’08 (University of Portsmouth, United Kingdom). Most recently her work appears in Mentor’s Bouquet, an anthology edited by Linda Leedy Schneider (Finishing Line Press, Fall 2009). Louise has always loved to write about the sacred moments in everyday experiences, but today these experiences hold even deeper meaning. In February 2003 she emerged from a two-week coma following an auto accident in which she suffered a traumatic brain injury. Though she struggled at first, she resumed writing as soon as she was able. Today Louise lives with her husband in Eden Prairie, Minnesota, where she continues to write and recover. Listen to and/or download the mp3 recording of today's program here. Or click on the Podbean player below. Click on the widget below to browse an excerpt from A Life Interrupted: Living with Brain Injury. For more information or to purchase, go to www.pearlsong.com/alifeinterrupted.htm. Update 10/21/12: Click here to listen to or download the 54-min mp3 recording of this Conversation. Join us Sunday, October 21, 2012 at 5 p.m. Eastern/4 p.m. Central for a Pearlsong Conversation with Louise Mathewson, author of A Life Interrupted: Living with Brain Injury. To receive the teleconference call detailed (phone number & access code), send an email to pearlsongconversations @ pearlsong.com. The call details will be automatically emailed to you. There is no cost for participating in the Conversation, other than any long distance toll charges that might apply. The Conversation will be recorded and available for listening/downloading afterward, but we'd love for you to join us "live" if possible. Everyone who calls in is encouraged to particpate in the Conversation as time and technology permit. A Life Interrupted is a collection of poems chronicaling Louise's recovery from a brain-damaging car accident. The book also contains a list of journaling therapy writing prompts and other resources she found helpful in transcending trauma. Join us this coming Sunday, September 9, 2012 at 5 p.m. Eastern/4 p.m. Central for a Pearlsong Conversation featuring Lonie McMichael, Ph.D., author of Talking Fat: Health vs. Persuasion in the War on Our Bodies. To receive the teleconference call details (phone number & access code), send an email to pearlsongconversations @ pearlsong.com. The call details will be automatically emailed to you. There is no cost for participating in the Conversation, other than any long distance toll charges that might apply. The Conversation will be recorded and available for listening/downloading afterward, but we'd love for you to join us "live" if possible. Everyone who calls in is encouraged to participate in the Conversation as time and technology permit. Talking Fat examines the rhetorical success of the "war on obesity" while considering its absolute failure to make people thinner or make a difference in the health of the American people. Dr. McMichael examines empirical studies and statistics as well as the actual experience of fat people, asserting that the past decade's messages about the "obesity epidemic" are about many things—including prejudice, profit, and control—but not about health. Instead, negative messages about fat have increased stigma and decreased health in the very people targeted for "help," while increasing profits for those perpetuating such rhetoric. Dr. McMichael argues that the current weight-centered paradigm is only hurting our society and the individuals within it, and calls for a change in policy and perspective on fat. Lonie McMichael has a Ph.D. in technical communication and rhetoric. She is currently teaching professional and technical writing at the University of Colorado at Colorado Springs. Talking Fat was published by Pearlsong Press in August 2012 and is available in original trade paperback and ebook. Click on the widget below to read and share an excerpt from Talking Fat. Ooops! We forgot to test the link to the recording of yesterday's Pearlsong Conversation with Michele Tamaran & Michael Wittner, authors of the new memoir ExtraOrdinary: An End of Life Story Without End. You can also listen to the hour-long Conversation via the Podbean player below. Pearlsong Press publisher Peggy Elam, Ph.D. chatted with the authors of ExtraOrdinary: An End of Life Story Without End, MIchele Tamaren and Michael Wittner, in today's Pearlsong Conversation. To read an except from ExtraOrdinary, click on the BookBuzzr widget below. Join Pearlsong publisher Peggy Elam, Ph.D. Sunday, July 15, 2012 at 5 p.m. Eastern/4 p.m. Central for a teleconference chat with Michele Tamaren & Michael Wittner, authors of ExtraOrdinary: An End of Life Story Without End. To receive the teleconference call details (phone number & access code), send an email to pearlsongconversations @ pearlsong.com. The call details will be automatically emailed to you. There is no cost for participating in the Conversation, other than any long distance toll charges that might apply. The Conversation will be recorded and available for listening/downloading afterward, but we'd love for you to join us "live" if possible! Click here for more info on ExtraOrdinary. ExtraOrdinary is available in original trade paperback and ebook format from Pearlsong Press and your favorite online retailers. To learn more about the Pearlsong Conversations series of teleconference chats with authors, readers and publisher, and for links to archived recordings of previous Conversations, click here.